On April 1st, we kicked off our free programme of youth and family events with our first Family Foreshore walk to Bankside. Bankside offers many attractions, whether it’s the stunning view of St Pauls across Millennium Bridge, the lure of modern art at the Tate or Shakespeare at the Globe, but if you take a look down and cast your eye over the foreshore, there is far more to be seen as the families who came along to the first Thames Discovery Family Walk discovered. After a health and safety briefing we descended the Founders Arms Stairs to the foreshore. We began the walk by talking about Southwark’s place in London’s history from its Roman roots right up to its industrial Victorian boom and mapped its dramatic transformation from tidal island to modern social, cultural hub. The foreshore is awash with interesting finds and features, so next we took a closer look at a number of drains that travelled from under the embankment out onto the shore. The drains are actually from a time when all of the sewage in both London and Southwark was emptied straight into the river. We explained how these drains helped to cause the infamous Great Stink of 1858. The Great Stink occurred when the pollution in the Thames reached its peak. The stench became so bad that MPs at Westminster couldn’t carry on with their work, and a solution was found. Sir Joseph Bazalgette was appointed to transform the way sewage was disposed of. He created a ground-breaking new sewer system which diverted sewage to pumping stations outside of London. His sewers were responsible for the construction of embankments at Westminster and Lambeth which were designed to house them. His sewers are still in use today, and now Tideway is working on the next addition to London’s sewer system; the Thames Tideway Tunnel, which will help protect the River Thames from sewage pollution for at least the next 100 years. The walk continued past the sewage pipes towards the remains of the jetty for the old Bankside power station (now Tate Modern) which are still visible on the foreshore. The children were also able to identify coal waste of the foreshore which gave us evidence of what was powering the plant. As the TDP team have licenses from the Port of London Authority to search on the foreshore, they helped to identify some of the finds discovered by the group, ranging from Victorian pottery and clay tobacco pipes to glass and even rubble from demolished buildings. To finish off the day in true Bankside style, we were able to visit The Rose, the first Tudor playhouse on Bankside, where the group were able to handle objects relating to the site. It was a great way for the families to connect with the history of the area and some of the archaeology that has taken place there! It is thanks to support from Tideway that we’re able to offer these sessions free of charge to all participants. 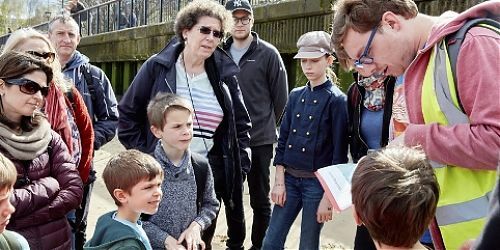 We will be running two more family walks this year, at Putney and at Deptford. Keep an eye on the MOLA and Thames Discovery Programme websites for more details of these and other upcoming events.